Take the Ole’s experience on the road! 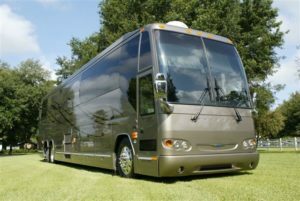 The Ole’s Big Game Coach is a luxurious, well appointed 45-foot Prevost motor coach that truly allows you to travel in style. This incredible, smooth-riding vehicle just came off the road carrying a very well-known country music entertainer and his entourage—and has been totally refurbished for Ole’s. 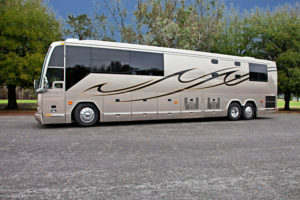 Plenty of comfortable seating for 20 to 25 people with leather and wood grain features, an on-board restroom, refrigerator, large flat-screen televisions with satellite TV, wireless internet, poker table, bar and food buffet area, three sleeping bunks with drop down DVD players, booth seating with table and much, much, much more! Day trips to Denver to see the Colorado Rockies, Denver Broncos, Denver Nuggets, Colorado Rapids, Colorado Avalanche or a concert at Red Rocks! Head to a Husker football game (home or away), NASCAR race, concert or event—we’ll take you about anywhere you and your group want to go! Experienced, licensed drivers on every trip—so you can relax in confidence. Delicious catered food and beverages from Ole’s available, too! 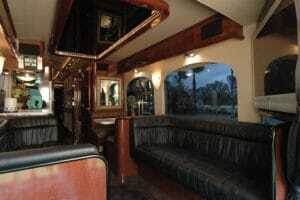 *Coach owned and operated by Executive Coach LLC.